Ernest Leonard RANDALL "I" was born in , , Alabama. He died in Oklahoma City, Oklahoma, Oklahoma. Ernest married Anna M..
Anna M.. Anna married Ernest Leonard RANDALL "I". M i Ernest Leonard RANDALL "II" was born on 22 Jan 1908. He died on 15 Apr 1984. 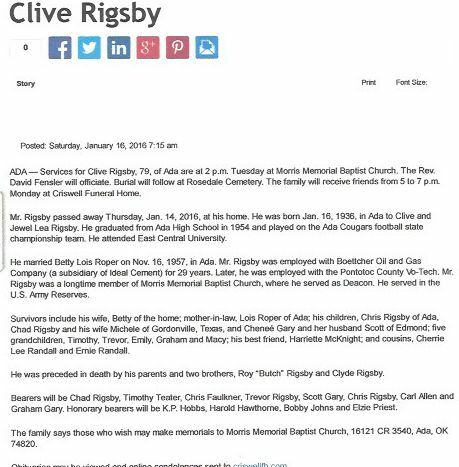 Clive Coleman RIGSBY "Jr" [Parents] was born on 16 Jan 1936 in Ada, Pontotoc, Oklahoma. He died on 14 Jan 2016 in At his home, Ada, Pontotic, Oklahoma. Clive married Betty Lois ROPER. The marriage ended in divorce. Betty Lois ROPER was born about 1940. Betty married Clive Coleman RIGSBY "Jr". The marriage ended in divorce. Chris Coleman RIGSBY was born about 1964. M ii Chad RIGSBY was born about 1965. F iii Chenee RIGSBY was born on 7 Feb 1967. 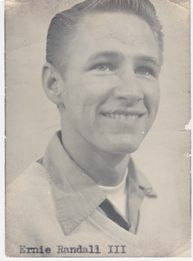 Roy Lea "Butch" RIGSBY [Parents] was born on 18 Dec 1943 in Ada, Pontotoc, Oklahoma. Roy married Margaret FULLER. The marriage ended in divorce. Margaret FULLER. Margaret married Roy Lea "Butch" RIGSBY. The marriage ended in divorce. WILLIAMS. WILLIAMS married Beatrice "Bessie" RIGSBY. Beatrice "Bessie" RIGSBY [Parents] was born on 19 Nov 1901 in Indian Territory, , Pontotoc, Oklahoma. She died on 14 Aug 1916 in , Pontotoc, Oklahoma. Beatrice married WILLIAMS. Ernest Leonard RANDALL "III" [Parents] was born on 18 Mar 1935 in Oklahoma City, Okla, Oklahoma. Ernest married Elizabeth BLAYLOCK on 31 Aug 1957 in Konawa, Seminole, Oklahoma. Elizabeth BLAYLOCK [Parents]. Elizabeth married Ernest Leonard RANDALL "III" on 31 Aug 1957 in Konawa, Seminole, Oklahoma. M i Ernest Leonard RANDALL "IV" was born on 24 Feb 1958. Eric Lance RANDALL was born on 4 Apr 1960 in Corvallis, Benton, Oregon. Ferman Foy "Buck" COLLIER "Sr" [Parents] was born on 19 Sep 1934 in Lula, Pontotoc, Oklahoma. Ferman married Cherrie Lea RANDALL on 17 Jun 1954 in Hickman Mills, , Missouri. 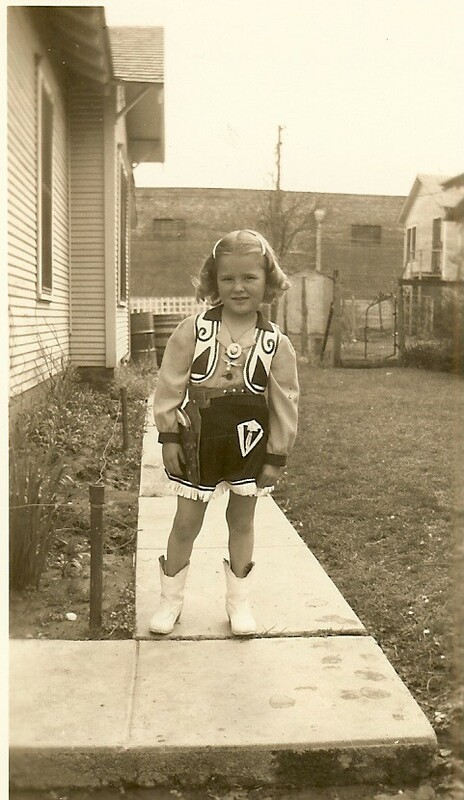 Cherrie Lea RANDALL [Parents] was born on 18 Nov 1937 in Ada, Pontotoc, Oklahoma. Cherrie married Ferman Foy "Buck" COLLIER "Sr" on 17 Jun 1954 in Hickman Mills, , Missouri. M i Ferman Foy COLLIER "Jr" was born on 4 Aug 1955. F ii Charlotte Sue COLLIER was born on 17 Oct 1959. M iii Phillip Michael "Mike" COLLIER was born on 21 Feb 1961. Ernest Leonard RANDALL "IV" [Parents] was born on 24 Feb 1958 in Newburg, Orange, New York. Ernest married Toni CLAWSON. Toni CLAWSON. Toni married Ernest Leonard RANDALL "IV". Chandler Reese RANDALL was born on 18 May 1995. William Elmer "Britches" COLLIER was born on 3 Jul 1906 in Indian Territory, Chickasaw Nation, , Oklahoma. He died on 7 Jul 1990 in Oilton, Creek, Oklahoma. William married Vera Lou CAMPBELL on 16 Dec 1828 in Lamar, Hughes, Oklahoma. Vera Lou CAMPBELL was born on 3 May 1905 in Indian Territory, Chickasaw Nation, Oklahoma. She died on 18 Aug 1993 in Oilton, Creek, Oklahoma. She was buried in Lula Cemetery, Lula, Pontotoc, Oklahoma. 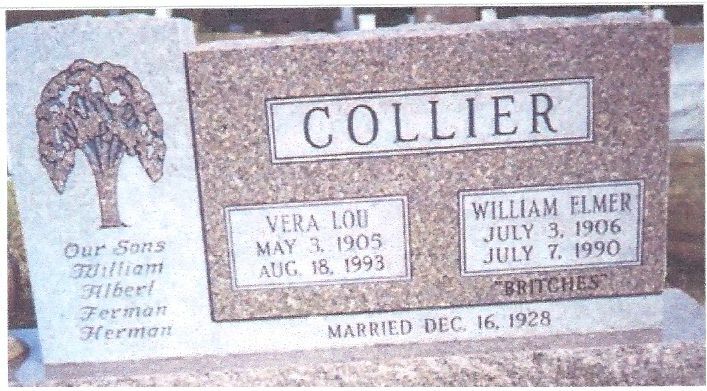 Vera married William Elmer "Britches" COLLIER on 16 Dec 1828 in Lamar, Hughes, Oklahoma. William F. COLLIER was born on 13 May 1930 in Lula, Pontotoc, Oklahoma. He died on 13 May 1930 in Lula, Pontotoc, Oklahoma. He was buried in Lula, Pontotoc, Oklahoma. Albert COLLIER was born in 1931/1933 in Lula, Pontotoc, Oklahoma. M iii Ferman Foy "Buck" COLLIER "Sr" was born on 19 Sep 1934. Herman Roy COLLIER was born on 19 Sep 1934 in Lula, Pontotoc, Oklahoma. He died on 9 Sep 1937 in Lula, Pontotoc, Oklahoma. He was buried in Lula, Pontotoc, Oklahoma. Ferman Foy COLLIER "Jr" [Parents] was born on 4 Aug 1955 in Ada, Pontotoc, Oklahoma. Ferman married Debbie. Debbie. Debbie married Ferman Foy COLLIER "Jr". Ferman Foy COLLIER "Jr" [Parents] was born on 4 Aug 1955 in Ada, Pontotoc, Oklahoma. Ferman married Joyce MC INTIRE. Joyce MC INTIRE was born about 1960. Joyce married Ferman Foy COLLIER "Jr".